Have you ever been pressured to lower your prices in order to book a job? Today, a floralpreneur® in my Facebook group shared that a client slashed her prices in half and re-sent the new pricing back to the florist!…..needless to say, the comments on that one made for some good reading! As a business owner and floral artist, it’s important to recognize that you don’t want every customer. You want the customers that want YOU…and are willing to pay your for your work! Business guru and genius marketer, Seth Godin, talks about Competing On Price as a “race to the bottom”. As Mr. Godin puts it, what do you do when you win?…ie. when you’ve succeeded and you’re “at the bottom”! The idea of “winning” based on undercutting, is a misconception. You cannot “win” if the only reason someone picked you is because you’re cheap-er. The real reason you don’t want to compete on price…. A florist cannot lower prices and exceed expectations at the same time!….not unless you’re giving up your profit margin. And if you’re going to sustain your business, you must respect your profit margin. I don’t want to win at the game of “cheapness”. I want to win at the game of quality work and amazing customer service. Do you want to be the cheapest? Or do you want to be better than the cheapest? I hope you’ll choose option #2 above! Don’t compete on price!…so you can keep doing beautiful work! You down with O.P.P? (Other People’s Proposals) Click HERE to read. How much should florists charge for rentals? Click HERE to read. What do florists charge for delivery? 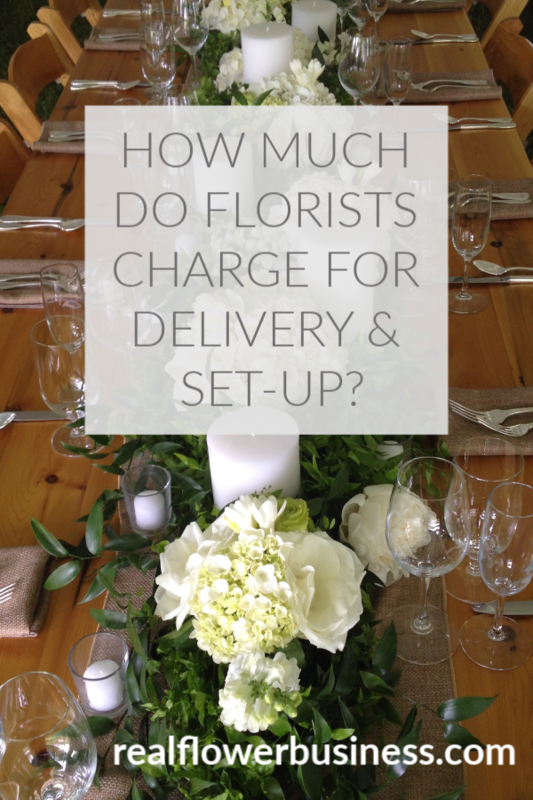 What should florists charge for delivery & set-up? On weddings and events you might call it “delivery” or “day of labor” or “set-up fee”….. I call it the :Delivery & Set-up fee” and it includes my time from the minute I start to load my van to the minute I’m done unloading it after an event. Your time is valuable and you should be paid for delivery and set-up. Delivery is more of a choose your own adventure aspect of pricing in your business. How much does it cost per van, per employee, per hour? Add a PITA charge=pain in the (you know what!) for holidays, inconvenient locations and overall hassle-factors. People expect to pay for delivery & installation (or set-up). A delivery fee is different from a design fee. The design fee is what you charge per design….it pays for your time and expertise in floristry. Delivery fee pays for your vehicles, labor, time spent waiting…. I used to be really nervous to increase my delivery fee. It took me years to realize what I needed to take into account to make it worth my while to deliver. Click below to watch: Price Talk Live! A replay from my Facebook group On Delivery & Set-up Fees! In this video I’m fresh off the heels of a Chapel Designer Workshop where I taught at Hope Flower Farm in May. Going to live workshops is invigorating and can leave me vibing for weeks. Connecting with people who share our passion is an amazing gift. I share a bit about who was at Hope and what we did there in this live chat, but you can skip ahead to the delivery & set-up tips if you fast forward to 4:25 minutes in! I charge based on what it costs to “do this job”…. I calculate this on a per hour basis and also consider the mileage, number of helpers, number of vehicles, whether I have to climb a ladder and whether I have to come back or stay on call to move things between the ceremony & reception. My delivery fee isn’t related to how much my client spends, it’s based on how much I need to make that entire day work seamlessly so that I meet their expectations and also cover the time I invest. The bigger the event, the bigger the delivery and set up fee. Delivery may sound simple, but theres a level of care, expertise and professionalism that comes with the job. Making money in your business should not be a mystery. Florists must have clarity on pricing. Move forward pricing well, making a profit, and give yourself a pay increase with a small bump in your delivery fee. And, by the way, as I mention in the video above, there’s a monthly payment plan on Flower Math for $49 per month for 1 year (click here). You get the entire course right away and you can take 1-year to pay. If you need Flower Math, I’m happy to extend this payment plan option to make it more accessible. Don’t hesitate to be in touch with any question for me. Click here to join me in my Facebook group for future livestreams! 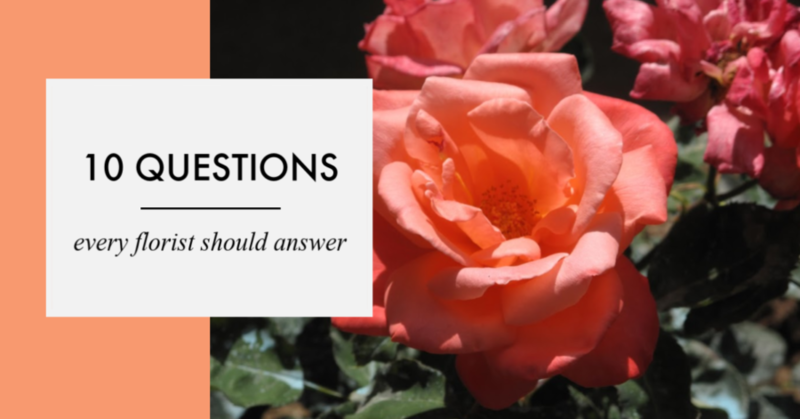 Click here to watch: 3 Numbers Florist Need To Know! The teacher lineup at Hope included: Holly Chapple, Gregor Lersch, Hitomi Gilliam, Francoise Weeks, Passionflower Sue (Susan McLeary), and I was invited to speak about business (specifically pricing & website stuff!). It was a honor to be on the roster with these legends and incredible floral pros.